Fab 'n' Funky Challenges: Challenge #11 - "It's childish" ! Challenge #11 - "It's childish" ! We hope everyone had a great Valentine's Day and were spoilt by their love ones and also in turn spoilt the love(s) of their life. The DT had great fun visiting all your blogs to have a good nose at your fab makes for last weeks challenge. As always Mrs Random.Org has chosen the winner of the Fresh Brewed Designs digi images and that person is . . . Please could you email Heather of Fresh Brewed Designs ensuring that you add "Fab 'n' Funky" challenge winner in the subject line to claim your $10 gift certificate. who is giving away a georgeous set of rubber stamps to the randomly chosen winner of this weeks challenge . . . the lucky winner will receive the "Dolly Mixtures" set as shown above . . you lucky devils ! Now to win these georgeous stamps, just make a card, 3D project, scrap page etc utilising this weeks theme which is . . . Some of the DT have used the theme to celebrate the safe arrival of Jilly, Ginny & Andrea's grandchildren into their families and one DT member is waiting anxiously to become a grandparent for the first time . . . how exciting. 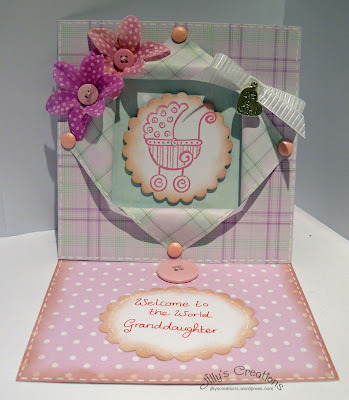 Now you can make a baby card &/or| project or alternatively a child themed card/project . . . the choice is yours ! You interpretate the challenge that suits you! To kick you off, here are the DT's fab 'n' funky projects . . .
Great theme! Love how many ways it can be interpreted. My card is to celebrate/welcome a new baby (which is a second daughter). Thanks for letting me play! Fun challenge! My layout is about my childhood piano teacher. Jounaling is on the pull out card in the library pocket. It tells about how she got me to sing my first solo, "I'm Gettin' Nuttin' for Christmas"! She said the song just reminded her of me! Guess I was a mischevious little one! Heehee! Great theme....you can't have enough child's cards! ooops, missed this one, but here's mine anyway! Thanks for the inspiration! Challenge #12 - "Colour combo"
Challenge #10 - "Shabby Chic"
Challenge #9 - "Emboss it " !